As the hot weather continues in London, having grilled food and a beer is in order. 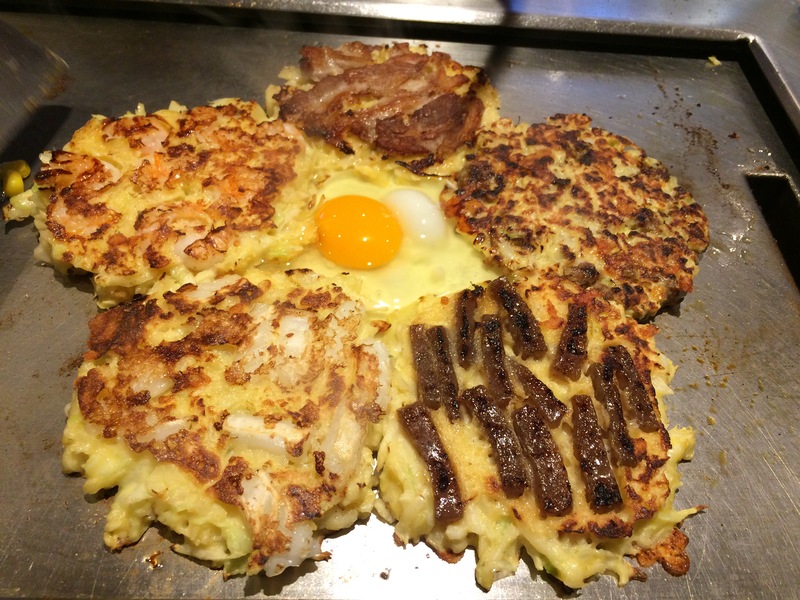 One of the best grilled food experiences I have had was in Japan eating okonomiyaki (Japanese savoury pancakes). As the name would suggest you eat whatever you want (okonomi-) grilled (yaki). Sounds simple but there is undeniably an art to making okonomiyaki from the ingredients to the way you shape it, flip it and grill it. While I would suggest getting the full blown experience going to Japan, you can sit back and have food flipping fun right here. From Osaka to London, Abeno is an acclaimed okonomiyaki restaurant located in Bloomsbury and Soho. Each table is equipt with a hotplate to watch your chef cook a sizzling pancake right in front of you. I recently went to Abeno too (Soho branch) and ordered the super deluxe Sakura-yaki, a special for cherry blossom season. This consisted of five mini pancakes of beef, bacon, squid, prawn and mushroom toppings in the shape of petal flowers. As you socialise and drink, your chef will mix each ingredient in a special dough and dropped it onto the hotplate to grill each side for a few minutes before flipping over with such skill. To complete the shape an egg is cracked in the centre and cooked sunny side up. Next, a small selection of sliced asparagus, cherry tomatoes and corn are grilled separately in a cube of butter before. Swirls of kewpie mayo, powdered seaweed and bonito flakes are added on top with the cooked veggies to follow to make this flowery concoction. This was an absolute delight to eat. Each pancake was reminiscent of mini pizzas but better. After all it doesn’t get better than the creamy mayo melting on top of the bite-size pieces of crispy meats and veg. You should probably start of eating the egg first as I noticed the low heat of the hotplate is still enough to overcook it. Nonetheless, it did add to the aesthetics to the meal. For a little over £20, this is a great meal. It is important to remember that more than the food itself, you pay for the experience of the staff being your personal chefs and the bustling fun atmosphere of Abeno. I will definitely come back again to treat myself or a friend. 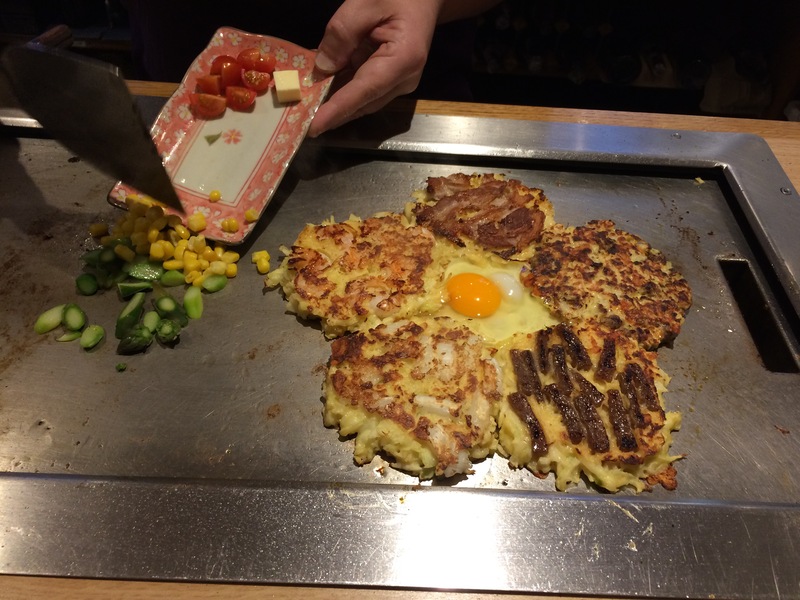 It would also be interesting to try the current seasonal special, Hokkai-yaki. This consists of curry-flavoured okonomiyaki with salmon, scallops, potato and topped with crispy onions. It certainly sounds like a spicy fish filling dish.